Overall Impression: This is great Shakespeare, profoundly moving and with great language. Per Bevington: Main source is G. B. Giraldi Cinthio's Hecatommithi, which was available in French translation to WS. Probably based on a real event in Venice c. 1508. WS considerably changed the story and added characters. Venice, a street before Senator Brabantio's house. Iago tells Roderigo (a "gulled gentleman") of Desdemona's elopement with Othello. Iago tells of his own hatred for Othello, since Othello passed up the recommendations made by Iago's mediators to name Iago his lieutenant and instead appointed Michael Cassio, a Florentine, to this position. Iago regards Cassio as less experienced and attributes the appointment to favoritism. Iago was given a subordinate position as Othello's ancient [ensign]. Iago gives vent to his dark thoughts, saying he will give the semblance of serving Othello while all the while serving his own purposes. He will disguise his true feelings, saying "For when my outward action doth demonstrate/The native act and figure of my heart/In compliment extern, 'tis not long after/But I will wear my heart upon my sleeve/For daws to peck at." Iago tells Roderigo to awaken the sleeping father of Desdemona, Brabantio, to "poison his delight" and "plague him with flies". Iago calls out "Thieves" and Brabantio appears above. Iago says "an old black ram is tupping your white ewe" and "the devil will make a grandsire of you" [Othello is older and a black African while Desdemona is fair]. Brabantio recognizes only Roderigo and tells him he is has already told him he will not allow Roderigo's suit for Desdemona. Iago compares Othello to a Barbary horse and says "your daughter and the Moor are now making the beast with two backs." Roderigo asks if Brabantio knows of the elopement, and tells him to search his house. Iago slinks away, not wanting to be associated with this covert action against his superior officer, knowing he must continue to put up an appearance of love for Othello. Roderigo laments the loss of Desdemona to Othello. Brabantio is incensed at Desdemona's actions and concludes she must have been charmed into it—he wishes he had given her instead to Roderigo and asks Roderigo to lead him to her. Venice, before Othello's lodgings. Iago speaks to Othello of Roderigo's alleged harsh words attacking Othello's honor, and asks if Othello and Desdomona have really married. Othello is confident the high regard in which he is held for his military actions will help him win against attack Brabantio's attack. Cassio arrives with others and tells Othello the Duke of Venice and senators want to meet with him immediately regarding news of a Turkish attack bearing down on Cyprus. Iago informs Cassio that Othello has married. Brabantio arrives with Roderigo. He threatens Othello with his sword, while Iago pretends to defend against Roderigo, but Othello refuses to fight his new father-in-law. Brabantio accuses him of enchanting his daughter with charms and drugs, and wants him taken before the Duke. Othello tells him he is already on his way there. Venice, a council chamber. The Duke, senators, and officers meet. The Turkish fleet is said to be bearing on Cyprus, then another messenger says it heads instead for Rhodes, then another says the fleet joined another on its way to Rhodes, and that the now larger fleet is again heading toward Cyprus. Duke tells Othello he must go to Cyprus to defend against the Ottomans. Brabantio presents his case against Othello, claiming Othello used witchcraft or potions to win Desdemona "against all rules of nature". Othello offers to tell his "unvarnished" tale of how he fairly won her, while they send for the lady to tell her version. Othello says her father had welcomed him into his house and had questioned him about his exotic origins and heroic deeds. Desdomona heard these stories and was greatly impressed, taking pity on him and falling in love with him. Desdomona arrives and confirms that she has a duty not just to her father but now to her husband as well. Brabantio gives her to Othello and washes his hands of her. The Duke counsels that Brabantio should not mourn that which cannot be undone and advises him to be philosophical, but Brabantio remains bitter. Duke asks Othello to leave for Cyprus that night [to serve as governor and defend the island], an assignment which he readily accepts as he is accustomed to war. He asks that Desdomona be properly placed. Her father does not want her, and Desdomona wants to join Othello. Othello agrees and assures the council that it is not for reasons of sexual pleasure but to satisfy her wish that he wants her to come to join him. Desdomona is left with Iago and his wife Emilia to join Othello soon. Brabantio warns Othello that Desdomona has deceived him, so may also deceive Othello. After they have all left, Roderigo laments that he will drown himself, but Iago speaks contemptuously of virtue and suicide for love and talks him out of it, arguing for reason over passion. He argues that she will soon tire of this unnatural marriage and that he should gather money for Iago to help him pursue his desire to win her. They pledge to pursue revenge against the Moor jointly. To himself, Iago boasts he is making this fool his purse. He decides on a plan: to claim to Othello that Cassio is too familiar with Desdomona and says "Hell and night/Must bring this monstrous birth to the world's light." Seaport in Cyprus, near the quay. The "substitute" [i.e., deputy] governor of Cyprus, Montano, looks out to sea with other gentlemen at the storm raging. The Turkish fleet is halted by the storm. Michael Cassio arrives by ship, and expresses worry about the fate of Othello. Iago then arrives in another ship. Cassio describes to Montano Othello's marriage to the divine Desdemona, "our great captain's captain". Iago enters with Desdemona, Emilia, and Roderigo, and Cassio is quite affectionate with the ladies, asking Iago to forgive his "bold show of courtesy" to Emilia which results from his breeding. Iago jests about his wife's traits, talkativeness etc. Desdomona playfully asks Iago how he would describe her, and they exchange witty word play about fair, foul, black, white, wit, foolish, etc. To himself, Iago plots how Cassio's affection to Desdomona will play into his purposes, saying "With as little a web as this will I ensnare as great a fly as Cassio." Othello finally arrives by ship. and greets Desdomona with great happiness. He also greets his old friend, Montano. Iago speaks privately to Roderigo, telling him Desdomona loves Cassio and that her expression of love for the Moor is false, since he is like a devil and "very nature will instruct her" in finding an alternative lover. He speaks of her lecherous thoughts, how she and Cassio "met so near with their lips that their breaths embraced together." He tells Roderigo to provoke Cassio that night while Cassio is on watch [presumably in order to neutralize this competitor]. After Roderigo exits, Iago muses to himself how he suspects the lusty Moor has had relations with Emilia, and how Iago has himself lusted for Desdomona. He plans to practice "upon [Othello's] peace and quiet/Even to madness." Cyprus, a street. The herald announces that Othello has proclaimed a night of celebration for the victory and for his nuptials. Cyprus, the citadel. Othello assigns the guard to Cassio and retires with Desdomona to at last consummate their marriage (Iago: "He hath not yet made wanton the night with her; and she is sport for Jove.") Iago talks with Cassio, suggesting Desdomona is provocative, but Cassio does not agree. Cassio does not want to drink, recognizing that he does not handle drink well and has already had a glass, but Iago talks him into it and they all drink. Iago sings drinking songs, Cassio gets drunk, then claims the lieutenant is to be saved before the ancient. Iago hints to Montano that Cassio has a drinking problem and wonders why Othello trusts him so. Iago sends Roderigo to provoke Cassio. Cassio enters chasing Roderigo drunkenly and strikes him—Iago raises a cry for help. Cassio attacks Montano, who has tried to restrain him. Othello arrives and castigates Cassio for the brawling, for which Cassio can make no satisfactory explanation. Othello asks who started the fight. Iago pretends he does not want to incriminate Cassio and seems to try to defend him, while implying his guilt. Othello tells Cassio he is no longer his lieutenant and returns to bed with Desdemona. Cassio laments with Iago his downfall and shame from drink ("O God, that men should put an enemy in their mouths to steal away their brains!"). 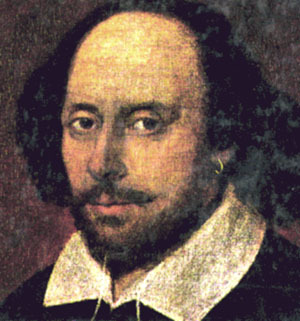 But Iago minimizes the importance of reputation: "Reputation is an idle and most false imposition, oft got without merit and lost without deserving." Iago recommends that he appeal to Desdomona to plead his case with Othello. To himself, Iago says he will plant the idea with Othello that Desdomona makes her appeals for Cassio because she lusts for him—"So will I turn her virtue into pitch". Roderigo returns and laments his declining money and lack of results, but Iago counsels that "wit depends on dilatory time". Before the chamber of Othello and Desdomona. Cassio arrives with musicians, who play. A clown [country rustic] appears, speaking in puns about wind instruments, says "thereby hangs a tail" [rather than the usual "tale" in AYLI and MWW]. Cassio asks to speak to Emilia. Iago arrives and Cassio tells him he has asked to speak to Emilia—Iago exits. Emilia tells Cassio that Desdomona is already advocating for him, and that Othello will soon restore him. But Cassio asks nevertheless to speak to Desdomona alone, and enters their quarters. The citadel. Othello tells Iago he plans to walk with others on the fortifications (breastworks) of the citadel and asks him to deliver letters to the Senate. The garden of the citadel. Desdomona meets with Cassio and Emilia; Desdomona assures Cassio she will do all she can for him, and will work on Othello until he relents. Othello and Iago appear in the distance and Cassio decides to exit, not wishing to speak then to Othello. Iago spots them and says to Othello "Ha? I like not that." Othello has also seen Cassio depart from Desdomona and Iago begins to plant seeds of doubt about her fidelity. Desdomona says to Othello she was meeting with Cassio, says he is penitent—Othello says he will not deny her wish to see Cassio reinstated. He concludes "When I love thee not, Chaos is come again." Iago continues to build his subtle case against Desdomona. He asks if Cassio knew of Othello's love for Desdomona while Othello wooed her—he answers yes. Othello wants Iago to explain his evasive suspicions and ruminations. Iago cautions Othello not to be jealous and feigns reluctance to divulge his inner thoughts. Iago reflects on reputation "Who steals my purse steals trash" [quite opposite to his sentiments expressed earlier to Roderigo] and cautions him about the "green-eyed monster" of jealousy. Othello is incensed, his concern piqued, but he would require proof. Iago advises him "Look to your wife;/ observe her well with Cassio". Iago reminds him that Desdomona deceived her own father. Iago suggests that Desdomona desires a match "Of her own clime, complexion, and degree,/Whereto we see in all things nature tends". Iago says to "leave it to time" and not draw hasty conclusions, then exits. Othello says to himself "If she be false, then heaven mocks itself." Desdomona and Emilia reappear to Othello. His head is in pain and she offers her handkerchief—he refuses it and it drops to the ground as she focuses on her husband's distress. Emilia picks it up after the couple leave, knowing her husband has asked for it. Iago appears and she gives it to him in secret and after a bawdy interchange. He refuses to tell her what he intends to do with it. To himself, Iago plans to use the handkerchief as evidence, saying "Trifles light as air/Are to the jealous confirmations strong/As proofs of holy Writ" and knows that his poison is already working on the Moor. Othello is tormented by Iago's insinuations ("thou hast set me on the rack"), laments the loss of his tranquility, wishing he were not aware of her alleged infidelity. He becomes angry with Iago, and Iago pretends that he regrets being so honest. Iago wants to know what evidence would be available that would prove her infidelity, commenting that they are unlikely to catch her actually being "topped". He relates an episode when he lay asleep with Cassio in which Cassio spoke in his sleep of Desdemona, telling her to be wary of their love, kissing Iago as if it were her, and then he put his leg across Iago. He pauses though, claiming this was but a dream, but Othello thinks it was a "foregone conclusion". Now he wants to tear her to pieces. Iago tells Othello he saw Cassio wiping his beard with the handkerchief. Othello's rage increases. Iago suggests that Othello delay the reinstitution of Cassio in order to observe Desdemona's behavior. Othello asks Iago to murder Cassio within 3 days and wants to murder Desdemona. Before the citadel. Desdomona asks the clown where Cassio can be found, accompanied with more word play. Desdomona is worried about the lost handkerchief and Emilia fails to take the opportunity presented to tell her she found it and gave it to Iago But Desdomona denies Othello will be jealous, saying it is not in him to feel so. Othello appears and queries her about her moist hand, suggesting she has a liberal (licentious) heart. She begins to plea for Cassio, but he wants her to lend him her lost handkerchief. She cannot produce it, and he tells of its origins, sewn by a sibyl and having magic powers to hold marriage together, passed down to him from his mother. He demands she produce it, but she still is absorbed with advocating for Cassio. Othello leaves. The pragmatic Emilia interprets his angry behavior as jealous but Desdomona doesn't understand why he should be. Iago and Cassio arrive. Cassio pleads again for Desdomona's help, but Desdomona says her master is not receptive now. Iago wonders with her why Othello could be angry, then exits. Desdomona wonders with Emilia why Othello should have such ideas, but Emilia comments on the irrationality of jealousy. Desdomona promises again to Cassio to plead his cause. Desdomona and Emilia exit. Bianca, a courtesan and mistress of Cassio, arrives and wants to know why he has been staying away from her. He gives her Desdemona's handkerchief, asking that she have it copied. She is jealous, wondering where he got it. Cassio does not want to be seen with her for the time being. Before the citadel. Othello speaks with Iago— he has become obsessed over the alleged unfaithfulness of Desdomona. Iago has told Othello that he saw Cassio with the handkerchief bragging about lying with his mistress. Othello feels the rage of his jealousy and rationalizes that it must be grounded in fact, since "Nature would not invest herself in such shadowing passion without some instruction." He falls in a trance. Iago gloats that his poison is working. Cassio appears and Iago tells him that Othello is having an epileptic fit. Cassio leaves. Othello awakens and thinks Iago mocks him about his sore head, as if it were growing cuckold horns. Iago suggests Othello hide and observe Cassio when he will again brag that he is "to cope your wife." Othello stands aside and Iago questions Cassio about Bianca (not Desdemona as he said to Othello.). Cassio makes jokes about her, saying he would never, as a customer, want to marry her, that she [Bianca] is persuaded only out of her own love that they will marry. Bianca arrives and angrily returns the handkerchief to him. Othello left alone with Iago concludes Cassio cared so little about Desdomona that he gave the handkerchief she had given him to Bianca. Othello is now determined to kill Desdomona. Iago suggests he strangle her in bed rather than poison her. Lodovico, a kinsman of Desdomona, arrives from Venice, and enters accompanied by Desdomona. Othello reads the letter Lodovico brings, but makes angry comments about Desdomona, finally striking her and implying her infidelity. Iago in private disparages Othello to Lodovico, and Lodovico wonders if this is the noble Moor so unshakable in the past. The citadel. Othello questions Emilia about Desdomona, but Emilia defends her and suggests some wretch has put the wrongful ideas in his head. Othello thinks she is merely an effective liar and is assisting her in her liasions. Desdomona enters with Emilia. Othello is insulting, implying they are like customer and whore, and asks Emilia to guard the door for the "procreants". He interrogates Desdomona, asking her to swear she is honest (faithful), but accuses her of being false. He will not believe her, calling her a whore. He leaves, giving Emilia money as if for services. Desdomona asks Emilia to lay out her wedding sheets. Iago arrives and Emilia tells him of the cruelty Othello showed to Desdomona. Emilia suspects there is a villain who has put Othello up to this, but she does not suspect Iago. Desdomona hopes to win back the affection of her husband. Iago attributes all this begavior to Othello's concern with the business of the state. Roderigo and Iago meet. Roderigo accuses Iago of accomplishing nothing for his efforts, jewels, and money. But Iago reassures Roderigo he will soon have Desdomona. Iago tells Roderigo that the Venetian commission has sent word to deputize Cassio in Othello's place as governor, and to send Othello to Mauritania (Africa). Iago wants Roderigo to kill Cassio, thereby delaying the departure of Othello, and tells him that Cassio sups that night with Bianca. The citadel. Othello, with Lodovico, tells Desdomona to go to bed and to dismiss her attendant. Left alone, Emilia prepares Desdomona for bed. Desdomona has foreboding thoughts and asks that she be wrapped in the wedding sheets if she should die before Emilia. She recalls the sad "Willow" song taught her by her mother's maid from Barbary, and sings it, though frightened by sounds she hears. She asks if Emilia would be unfaithful for all the world. Emilia is pragmatic and would indeed be so, suggesting wives should repay husbands for their own infidelity. But Desdomona would not be unfaithful even for all the world. A street in Cyprus at night. Iago positions Roderigo to attack Cassio as he leaves Bianca. Roderigo attacks but Cassio stabs him. Iago, from behind, wounds Cassio in the leg. He later reappears as if he had not been there before and summons an alarm. Othello arrives and is happy to see Cassio lying wounded. Gratiano (also a kinsman of Desdomona) and Lodovico appear but are cautious and stand off. Iago acts as if he is defending against Cassio's attacker and kills Roderigo, then tends to Cassio's wound. Bianca arrives and Iago expresses suspicion of her involvement in this plot. Emilia arrives, and Iago instructs her to tell Othello and Desdomona of the attack. A Bedchamber in the citadel. Othello enters, Desdomona is asleep in her bed. He debates killing her, and kisses her, "So sweet was ne'er so fatal". She awakens and he asks her if she has said her prayers, and wants her to confess her sins. He accuses her of giving the handkerchief to Cassio, which she denies. He says Cassio is dead, and she weeps—this angers him and in a rage he smothers her despite her pleas. Emilia arrives and, not seeing Desdomona, informs him of the murder of Roderigo and that Cassio lives. She discovers Desdomona and calls him a devil, saying Desdomona was true to him. He tells her Iago told him that Cassio and Desdomona were lovers, and she says he lied. She ignores his threats with his sword and calls out Murder. Montano and Gratiano and Iago arrive. Emilia demands that Iago refute Othello. 's version of what happened, and when he sticks to his story she calls him a liar and villain. Othello falls on the bed and cries out in despair and Emilia says "Nay, lay thee down and roar;/For thou hast kill'd the sweetest innocent/That e'er did lift up eye." Iago threatens Emilia with a sword but she will not cease her accusations. She says she gave the handkerchief to Iago, who had begged her to steal it. Othello runs at Iago, and in the scuffle Iago stabs Emilia, then flees. Othello is disarmed, then Montano and the others chase after Iago, leaving Othello locked in with Desdomona and Emilia. Emilia tells Othello that Desdomona was chaste, then dies. Gratiano reenters. Othello has pulled out a hidden knife. He is remorseful and knows he is condemned to hell. Cassio is brought in on a litter with Lodovico, Montano, officers, and with Iago as prisoner. Othello wounds Iago and is disarmed. Othello calls himself an "honorable murderer", acknowledges he plotted with Iago for the murder of Cassio. Iago refuses to speak further. Lodovico produces letters found on Roderigo which tell of his plot with Iago to kill Cassio. Cassio says he found the handkerchief in his room, and Iago has confessed to planting it there. Roderigo's letter also tells of the plot against Cassio while he was drunken and on watch. Lodovico announces that Cassio is now governor of Cyprus, and that Iago will face torture to force further confession. Othello asks that "When you shall these unlucky deeds relate,/Speak of me as I am; nothing extenuate,/Nor set down aught in malice. Then must you speak/Of one that loved not wisely but too well." He stabs himself, saying to Desdomona "I kissed thee ere I killed thee. No way but this,/Killing myself, to die upon a kiss." Lodovico commands Iago to look on the tragic outcome of his plotting. He commands Cassio to seize the fortunes of Othello and to arrange the censure and torture of Iago. He will return to Venice to relate what has happened. .